Considered an invasive weed, this shrub is, however, an important forage plant for many animal species. It is very drought tolerant, sporting a long taproot below the soil surface, and can survive fire readily. 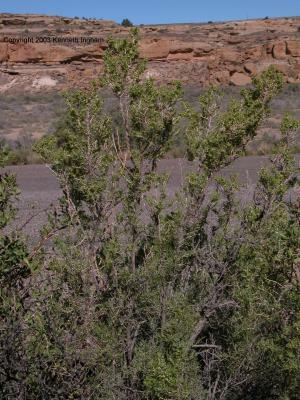 Description: Greasewood is a 1-2 meter-tall shrub that is found growing throughout New Mexico and the Southwest on saline or alkaline soils. We've observed it in great profusion in Chaco Canyon. The green fruits are small, but distinctive and it has linear, fleshy green leaves. General: Perennial native, long-lived shrub with spreading, rigid branches, sporting some spines. Seeds: Green or tan achene with a membranous wing. Seeds are more numerous following disturbance. Flowers: Usually has both male and female flowers on the same plant (monoecious), but they can be on separate plants (dioecious). Male flowers are catkin-like spikes on the ends of branches. Female flowers usually occur singly in the axial of leaves and form the fruits that are surrounded by a green membranous wing. Elevation: Varies by location, but Carter (1997) lists 5,000-6,500 ft (1,520-1,980 m). Bark: Whitish, graying at maturity. Plant height: 3.3 to 8.2 feet (1-2.5 m). Leaves: Linear, succulent, pale green, 1.5-4.0 cm in length, margin entire. Some opposite and some alternate. Greasewood sheds its leaves in winter. Habitat and range: Occurs from Canada to Mexico in the western U.S., from Washington to North Dakota and New Mexico to California. See entry in the US Department of Agriculture Plants Profile. No county distribution maps are available at the USDA site, but range information is available in Carter (1997) and Ivey (1995). Ecology: The numerous seeds are wind-dispersed and help to re-establish the plants after fire, although greasewood is only slightly harmed, if at all by fire, and will resprout. Greasewood is forage for many animals including: jack rabbits (major food item), prairie dogs, California quail, and pronghorn (Elmore, 1976). The plants are provide shade and protective cover for many small mammals. Human uses: Indians used the seeds and leaves, which taste salty, for food (Elmore, 1976). 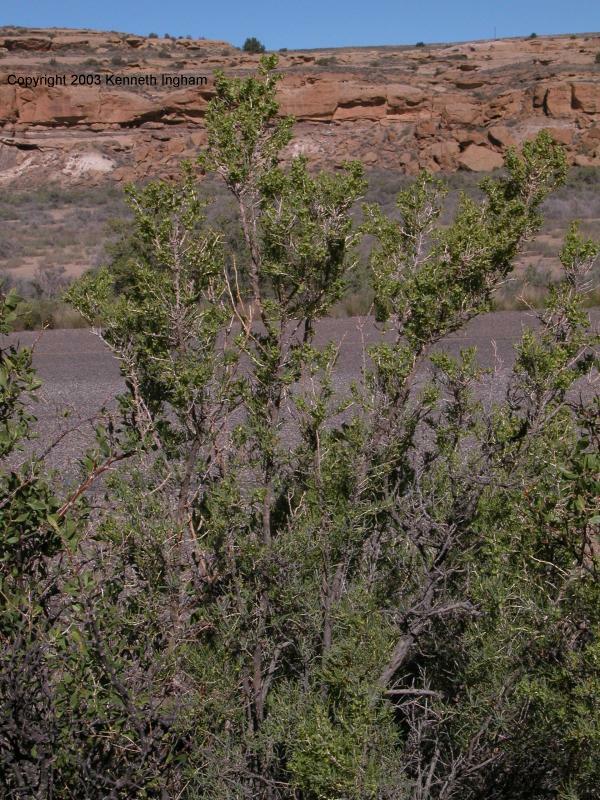 The Hopi and other Native Americans use greasewood for fuel and for planting sticks (USDA Plant Profiles). In Chaco Culture National Historical Park greasewood was used for construction, especially of lintels, for fuel, being a preferred wood for Pueblo kiva fires (NPS, n.d.). Overview of greasewood plant. Note the rigid, spreading branches. This photo was taken on the Wijiji ruin hike at Chaco Culture National Historical Park, New Mexico. 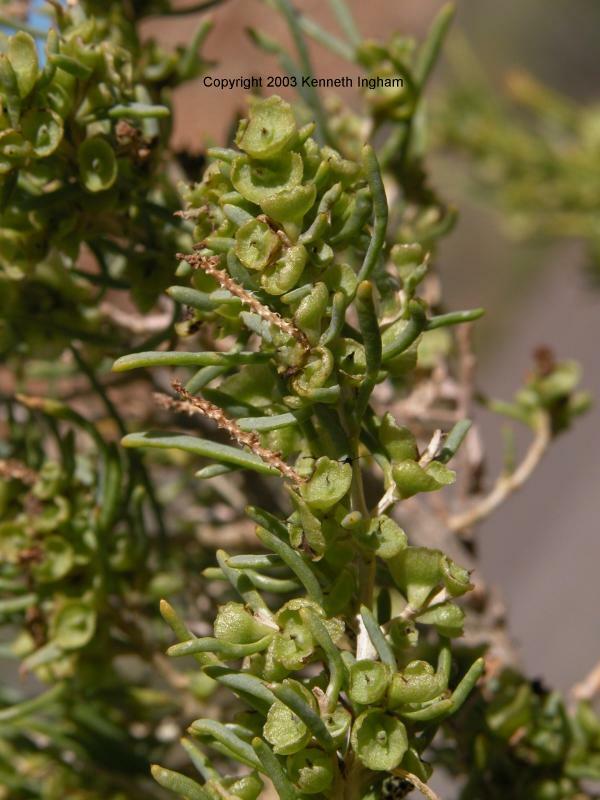 Closeup of greasewood plant. Note the linear, fleshy leaves and the fruit with green, membranous wings. This photo was taken on the Wijiji ruin hike at Chaco Culture National Historical Park, New Mexico. Used for an exhibit at the non-profit Great Basin Visitor Center in Baker, NV. Carter, Jack L. 1997. Trees and Shrubs of New Mexico. Boulder, CO: Johnson Books, distributor. Elmore, Francis H. 1976. Shrubs and Trees of the Southwest Uplands. Popular Series No. 19. Globe (AZ): Wouthwest Parks and Monuments Association. Ivey, Robert DeWitt. 1995. Flowering Plants of New Mexico. 3rd ed. Albuquerque: Robert DeWitt Ivey. Anon. n.d. Native Plants of Chaco Canyon: A Self-Guided Courtyard Walk . Chaco Canyon, NM: Chaco Culture National Historical Park, National Park Service.